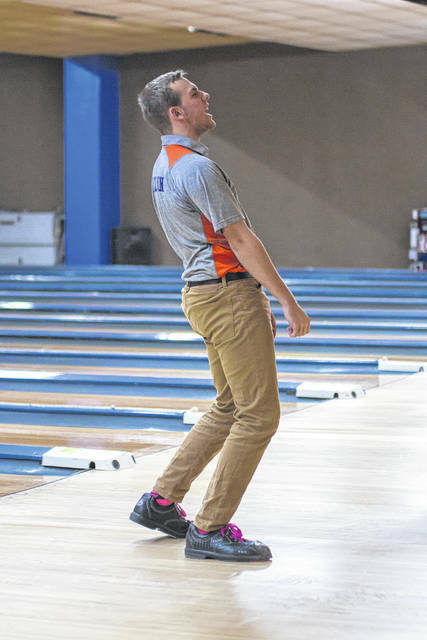 GALION — Austin Rinehart rolled games of 233 and 259 on Thursday as Galion’s boys bowling team knocked off Shelby 2,359-1,884 in Mid-Ohio Athletic Conference action at Victory Lanes. The pin total of 2,359 is a new Galion High School record for the boys team. The Lady Tigers weren’t quite as dominant, picking up a 1,075-1,006 win. Leading the way for the record-setting boys team was Austin Rinehart. His score of 492 was obviously the best of the day. Dylan Ruth posted a 396 (191, 205) on the day and the remaining three rollers, AJ Randolph, Alan Evans and Jacob Lear all finished with 371 to give Galion the 2,001-1,564 advantage heading into the Baker Games. The boys would roll a 155 and a 203 to add 358 to their new school record score. The Lady Tigers also earned a hard-fought victory on the day, downing the Lady Whippets by 69 pins; 1,075-1,006. Abby Crager was the high roller for Galion’s girls, recording a two-game series of 216 while also rolling the high game between the two teams with a 125. Halle Kiss finished with a 188-series while Neavia Cansler turned in a 152. Shiyenne Current rolled a 124 while Maleah Stratton bowled a 106 in game and Kaila Davis a 46 in game two. Heading into the Baker Games, the Lady Tigers held a slim, 31-pin advantage at 832-801. Galion recorded 128 pins in the first game and 115 in the second to take the match over Shelby, who managed a 104 and a 101. On Tuesday, Galion’s boys team beat visiting Ridgedale Rockets 2,239-1,604. Rinehart once again had the high game and series, rolling a 266 in game one and a 236 in game two for a 502. Ruth posted a 400 while Evans notched a 361. Randolph finished with a 337-series and Lear rounded out the Galion scoring with a 332-series. The Lady Tigers lost 1,473-991. Crager was awarded the high series for Galion, recording a 212 while Kiss was behind her with an 189-series. Current racked up a 173 and Stratton recorded 147 pins over the two games. Paige Donahue took the first game and rolled an 88 while Shelena Wilcox posted a 68 in game two of the split. On Monday, Galion’s boys team beat Pleasant 2,113-2,033. Ruth had the high game and series for the day, picking up 223 pins in game number one en route to a 438-series. Rinehart started off with a 214 but struggled in game two, rolling a 176 for a total of 390. Lear finished the day in Marion with a 353-series while teammate Evans notched 311 pins. Randolph rounded out the scoring for the visiting Tigers with a 302-series. The Tigers rolled Baker Games of 149 and 170 to secure the victory, their first of the year within the MOAC. Galion’s girls team scores were not made available to the Galion Inquirer at the time of our deadline. Erin Miller | Galion Inquirer Galion bowler Austin Rinehart celebrates during Tuesday’s match with Ridgedale Rockets. He finishd with two-game score of 502.
https://www.galioninquirer.com/wp-content/uploads/sites/38/2018/12/web1_Austin-Rinehart.jpgErin Miller | Galion Inquirer Galion bowler Austin Rinehart celebrates during Tuesday’s match with Ridgedale Rockets. He finishd with two-game score of 502.